Thanks to the lovely Katie, I feel like I really do start the week off right! Definitely feeling Marvelous In My Monday! I'm kicking this Monday off on a serious high note! This weekend was nothing short of amazing. We did nothing in particular except enjoyed family time and some amazing fresh air! We did get some gardening done. Finally I have a few plants that will hopefully give us some good fresh vegetables to enjoy later this summer. Sure, it's a little late, but we live in Atlanta, we will have plenty of time to grow things. I'm hoping to get in a fall garden in the other bed too. Maybe plant some kabocha? He'd been eyeing the watermelon juice coming from the fresh watermelon all week for a cocktail creation he wanted to try. It was beautiful outside and we had just finished up what we had wanted to accomplish, so it was officially cocktail time! This was delicious and refreshing...perfection! Along with it being perfect afternoon cocktail weather, it was also perfect burger weather! 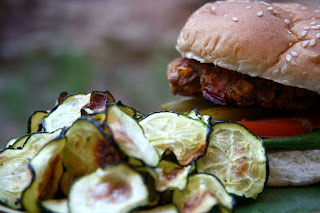 I had everything we needed to make our favorite homemade veggie burgers with a side of zucchini chips! Which also goes perfectly in the theme of Better With Veggies Meatless Monday From A-Z post for Flax! I'm a HUGE fan of flax in baking and for adding a little extra boost of omegas and fiber to salads and well anything really. I often use it for an egg replacer, but since we've gone gluten free, I really love adding it to our baked goods in general for a little extra fiber boost. In this recipe, it's a great binder to hold everything together. Nobody likes a veggie burger that crumbles. This one is the perfect combination of veggies, grains and protein! Bring this mixture to a boil and cook for 20 minutes. Add flax to the hot oatmeal lentil mixture and remove from heat. Process peppers, onions, peas and carrots in the food processor just to chop up a little smaller. Add this and the rest of the ingredients to the oatmeal lentil mixture. Stir to mix well. Refrigerate for 4 hours or overnight. When completely cooled, form into patties (wet hands keep it from sticking to you) and place on a parchment lined baking sheet. Bake for 20 minutes on each side (40 minutes total) at 375 degrees. Allow to cool slightly before serving. Did you get to enjoy some outdoor time this weekend? Hopefully you all have an incredible week! I'm sharing this on Slightly Indulgent Tuesday and Allergy Friendly Wednesday this week. 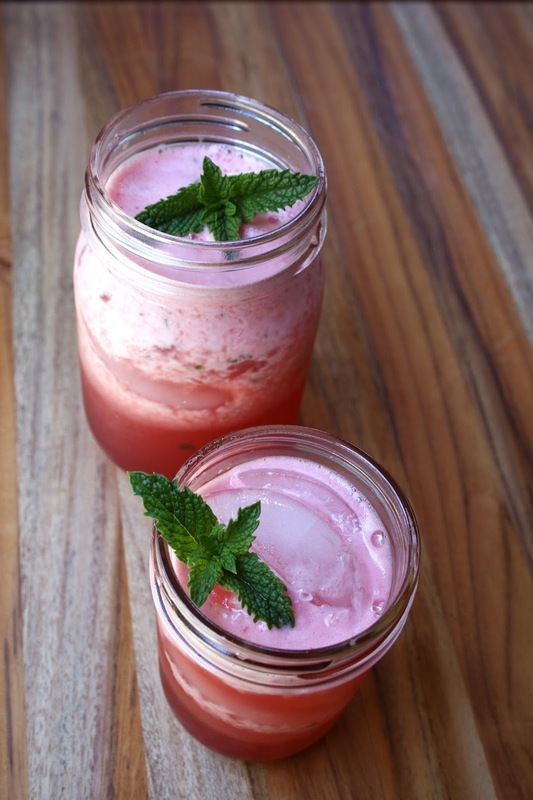 Those watermelon bevvies look DELICIOUS! 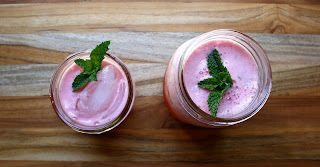 Perfect summer drink! I saw that drink on Facebook and turned green with envy. It looks so refreshing!!! 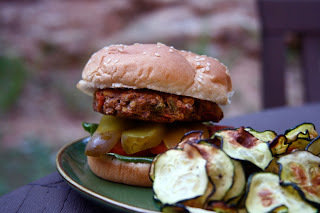 I love a good veggie burger - I need to make some more to keep in the freezer. So much better than the store bought. my husband would love this! can you just come back it for us? bring those cocktails too! This meal looks FABULOUS!!!! I saw that pop up in my email and was like, oooh yeah! What a great recipe. And those watermelon cocktails. YUM!! I'm still new to gluten-free baking (since I used to eat a lower carb diet before, but now I've switched to a plant-based diet with lots of legumes and whole grains and feel much better) and I've used flax a couple of times for binding and adding fiber (there's so little fiber in gluten-free grains :( ...), and that worked well, but I haven't used it in burgers much so far. Oh my goodness - everything looks so good!! 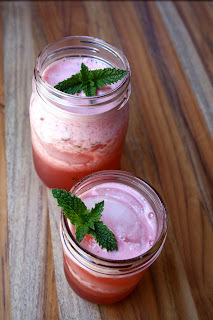 Especially that drink...SO refreshing for this oppressive heat! Love this recipe! I will def have to use it! late BUT finally making these tonight!